My Domestic Monastery: Happy Birthday, Little One!! 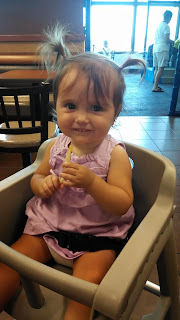 Celebrated by eating her first french fry, of course! I just had to pop in and say...Happy Birthday, Maria! What an absolute gift you are!! For the story of her arrival, click here. Happy first birthday to your little one. I love the pigtails!